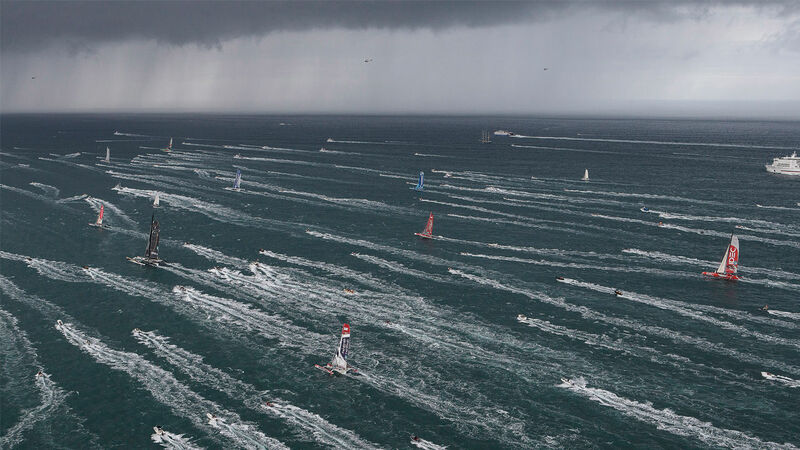 The start at St Malo: an intense moment, but also always risky, with 120 singlehanders on the line this year! Celebrations on the pontoons at St Malo, and then…a leap into the unknown for the majority of the skippers, with 3,543 miles to cover across the Atlantic. Who will succeed Loïck Peyron in the Ultim category? The winner of the 2014 edition will be setting off this year in the Rhum category, for pleasure! For 40 years, the skippers have taken the same route… But the race time has been divided by three. In the Ultim category, the fight will be particularly intense: hard to risk making a forecast! In the Multi 50 class, the victory will be hard-won… A class to follow...closely! Still in the Rhum category, the race of the ‘almost production boats’ will also be particularly interesting to follow. The Route du Rhum Destination Guadeloupe is an extension of the summer in the middle of autumn, a good swig of ti-punch before winter. It’s above all months of excitement for all enthusiasts, for a few days of racing, when we live to the rhythm of the placings, addicted to the websites, ‘night owls’ by proxy of a few skippers, as lucky as they are tenacious in pursuing their dream. Taking part in THE transat, the one everyone dreams about. But who are these lucky people who have succeeded in solving the magic equation of boat, budget and early qualification? That’s right, there weren’t enough places for everyone for this anniversary edition. 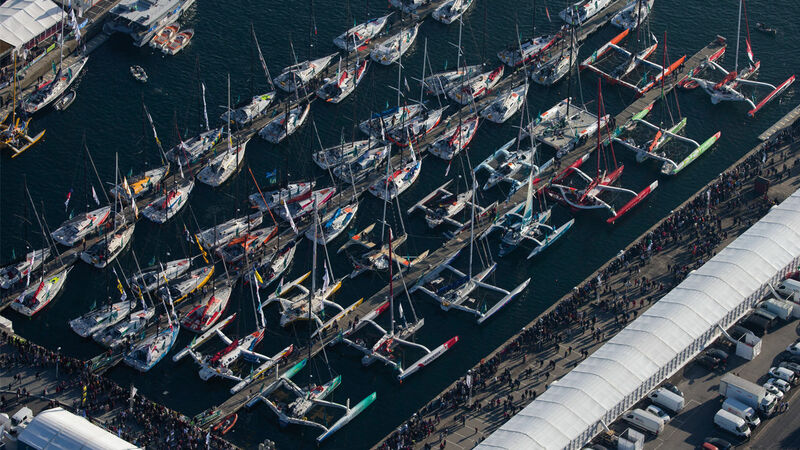 The pontoons will have to be pushed back to welcome a record number of participants: 122 boats at the start, including 32 superb multihulls, which will inevitably take line honors at the finish in Guadeloupe. And in this fortieth year, it’s very symbolic that the ‘queen’ of categories is that of the Ultims. Although these boats have recently acquired a very official class, called Ultim 32/23, which as its abstruse name indicates, limits the length (32 m max) and beam (23 m max), among other things, their excessiveness takes us back to the origins of the creation of this race, as a reaction to the excessively strict limits– 56 feet (17 m) - of the historic Ostar, the singlehanded English transat, created in 1960. 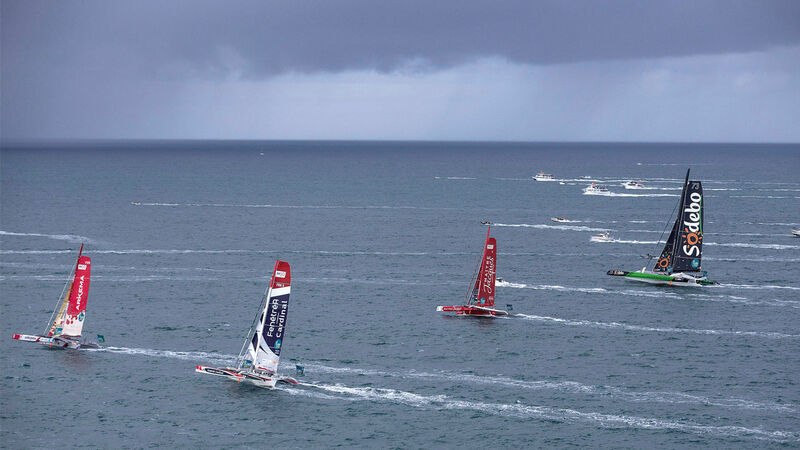 There will be six of them, five big shots and a young wolf, fighting certainly to be the first boat in all categories to tie up their trimaran at Point à Pitre. Giving honor where honor is due, the trimaran which has twice held the title will this time be sailed by Francis Joyon. In fact after having won in green in the colors of Groupama in 2010, in the hands of Franck Cammas, then the blue of Banque Populaire in 2014, with Loïck Peyron, it will arrive on the line at St Malo in Idec red. Equipped with new foils offering a 30% increase in vertical thrust, T-shaped rudders, a new gennaker, and with the return of the mythical bicycle operating the winches with leg power, and extremely careful preparation in the smallest detail, this is the yardstick for this edition. Still just as comfortable singlehanded after a victorious fully-crewed Jules Verne, Francis Joyon is the embodiment of quiet strength. The harder the conditions, the greater the chance of seeing him arrive as winner. Of course his trimaran is not as recent as Macif and Banque Populaire, and doesn’t benefit from the very latest architectural developments, but it has the advantage of being reliable and completely mastered by its skipper, as demonstrated by the completely trouble-free preparation.